How does the legal work of the GMIAU (Greater Manchester Immigration Aid Unit) help refugees to rebuild their lives? What motivates the caseworkers? How do refugees respond to the challenges that the asylum system throws at them? This exhibition is a celebration of the work that caseworkers do and a testament to the courage of refugees and people seeking asylum. 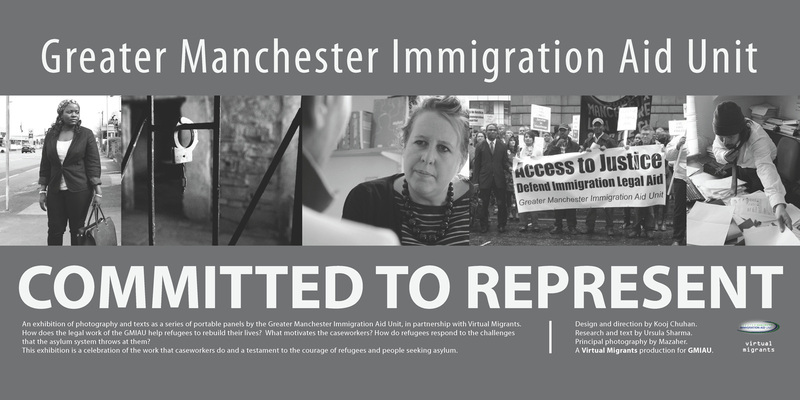 An exhibition of photography and texts as a series of 12 portable panels by the Greater Manchester Immigration Aid Unit, in partnership with Virtual Migrants. This exhibition is available for borrowing or hire (if you have available funds), and a speaker can be provided if desired. The panels can be set up to accompany any relevant event, activity, cultural or artistic programme involving an audience. Please contact us or contact GMIAU directly via www.gmiau.org . A gallery showing all of the panels is available to view right now at www.virtualmigrants.net/committedtorepresent/gallery , and photographs of the panels exhibited in various venues can be seen at www.virtualmigrants.net/committedtorepresent/exhibitionphotos. These will give a good idea of what the exhibition is and how it can be presented. Design and direction by Kooj Chuhan / Metaceptive Media. Research and text by Ursula Sharma. Photography by Mazaher. Committed To Represent – exhibition celebrating immigration caseworkers, refugees and people seeking asylum in 12 portable panels. Here is a quick overview of some places it has been shown at, followed by a statement from GMIAU. On Wednesday 30th October at 5.00pm there was a talk + preview of the “Committed To Represent” pop-up exhibition. A video of this including the powerful speeches by Isobel and Mavis will be put up online soon. We are in very turbulent times. During the past 12 months legal aid has been removed for most immigration cases and the government is ‘consulting’ on the next set of cuts which will include further restrictions on access to the law, including judicial review and appeals, and the insidious ‘residency test’. The Immigration Bill has been introduced and if it get passed as it is it will include duties on landlords and banks to check the immigration status of potential tenants and customers. Immigration will once again be top of the political agenda in the run up to general election in 2015 and none of the public debate about immigration is positive. This makes it even more difficult for the people that GMIAU is here to support and represent – not just in a legal sense but also to stand up against the injustice and discrimination that is the reality of many peoples day to day lives. We need our supporters more than ever. We need to work together to steer the organisation through these challenging times, to make sure not only that we survive but that we’re stronger and louder than before in our defence of access to justice and human rights. Please come and join us on the 25th need to be doing over the next year and beyond to make sure we stay at the forefront of creating a better and more positive contribution to the lives of people in the North West who need immigration legal advice and representation. 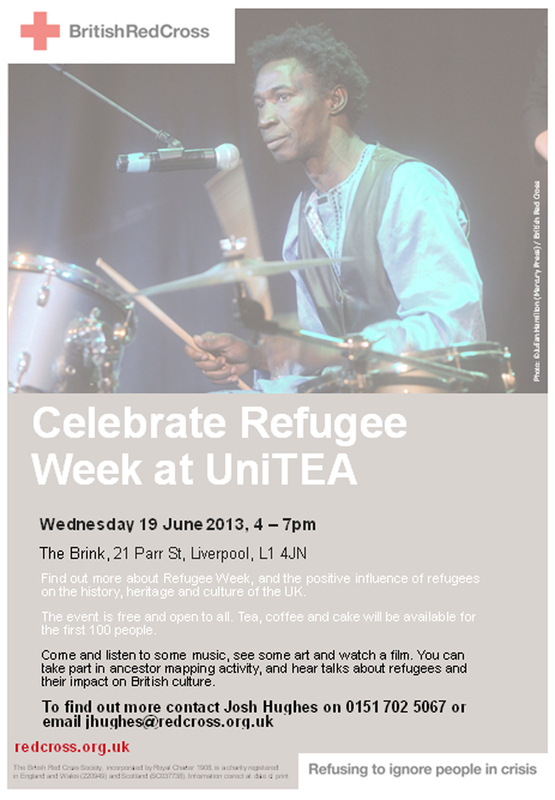 VM members Tracey Zengeni, Aidan Jolly and Sai Murray will be performing at this UniTEA Arts and Culture Event at The Brink in Liverpool today as part of Refugee Week. It’s a free event, open to all with tea, coffee and cakes of the world (!) available for the first 100 people. This is an arts and culture event, with 4 acts across the evening. The main theme of the evening is celebrating the positive contribution refugees have made to the culture history and heritage of the UK. Tracey Zengeni is Zimbabwean artist who is bringing several pieces of her art to show and talk about, in addition to some acapella . Raj Govindarajah is a Sri Lankan film maker who has made a film about his friends experience of fleeing Sri Lanka and becoming a refugee in Britain. Aidan Jolly and Sai Murray are a musician and poet respectively, who have worked with many refugee and migrant groups. There will also be a ‘Cakes of the World’ section, where desserts from common refugee origin countries will be available for attendees, and they can guess where the desserts originate. In addition, there will be an ancestor mapping activity to plot the journeys of attendees relations throughout history. The event is open to all, with free drinks tokens available to the first 100 people. It would be preferable if attendees could RSVP to: Jhughes@redcross.org.uk.